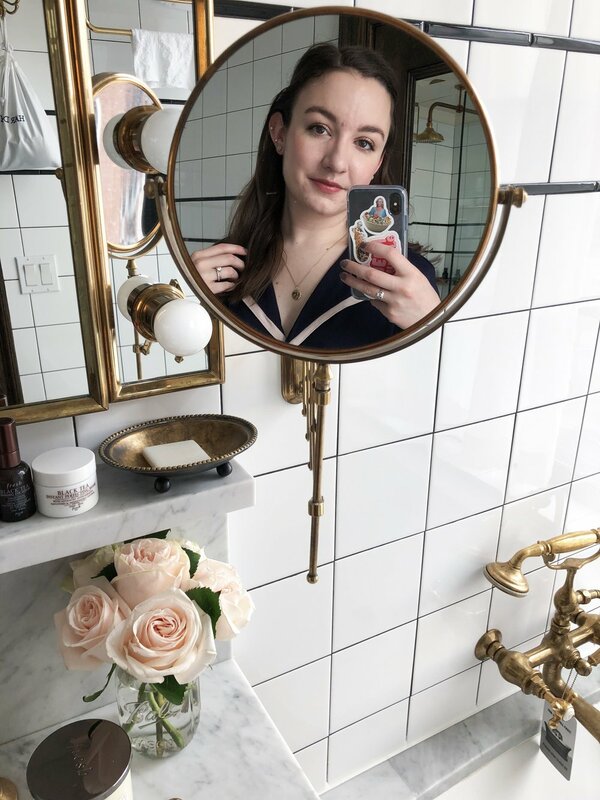 Trying out new skincare is one of my favorite things to do, even more than trying new makeup. It's just so relaxing to pamper yourself, and the scientist in me loves to look at it as an experiment. There's a fine line between trying new products and completely overloading the skin, and I am always toeing that line. It's so tempting to just try all the things, but that wouldn't make for a very well-designed experiment, would it? So far my skin hasn't had any adverse reactions besides the usual hormonal breakout, so so far so good! 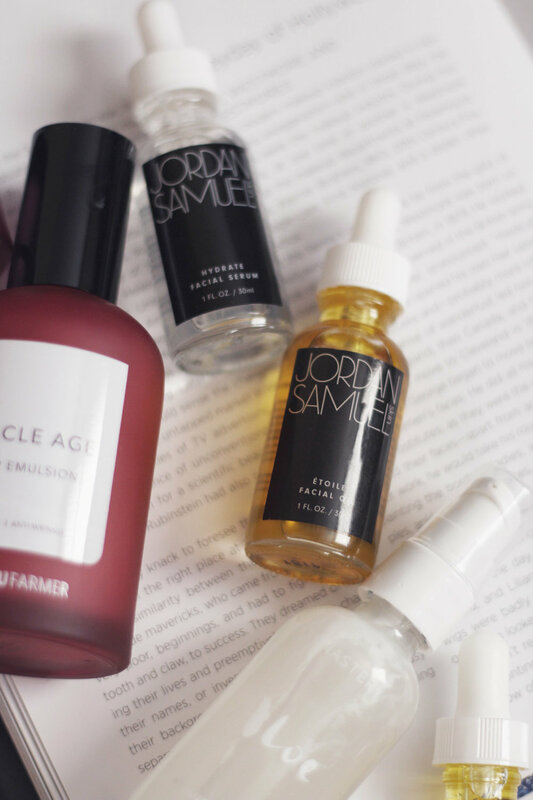 Jordan Samuel Skin | I wrote a whole post about the two products I've been using from Jordan Samuel Skin here, but I just wanted to pop in and say my skin has still been absolutely loving them. I'm going through them at a bit of an alarming rate, actually. The Hydrate Facial Serum is now my go-to to keep my skin hydrated and plump all day long, and I love how lightweight it feels. The etOILe Facial Oil has been giving my skin such a beautiful glow - it's really selling me on using oil blends as opposed to single-ingredient facial oils. Monastery | A couple absolutely beautiful products from Monastery have recently come in the mail, and I've been head over heels for them. Monastery makes products from whole, natural ingredients that contain no drying salts or alcohol, and that are infused with aromatic oils for a truly luxurious experience. I've been trying out the Aloe Hyaluronic Gel*, which is an extremely lightweight gel moisturizer. I use this as a serum rather than my sole moisturizer. It contains two forms of hyaluronic acid to better penetrate the skin, as well as aloe and clary sage to rebuild and restore damaged skin cells. It also contains lavender to soothe. It's so incredibly comforting on the skin, and it's been calming down my breakouts for sure. The Gold Botanical Healing Serum* was another one that sounded like a godsend for my currently stressed skin. It's a facial oil containing evening primrose, rosehip seed, squalane, and English walnut oils. It's also scented with Edwardian rose, ambrette, cistus, and rosewood, so it's really relaxing to use before bed. This has also been amping up my glow and helping my skin heal itself over the past few weeks - I'm obsessed. Thank You Farmer | Thank You Farmer is a K-beauty brand I've been super intrigued about, and they just recently became available at Ulta. I had been looking into picking up a few products when I got an email asking if I wanted to try some, so I jumped at the chance. I was sent products from the Miracle Age Repair line: Eye Cream*, Toner*, Serum*, and Emulsion*. They all work to brighten and restore the skin's natural glow with peony extract and burdock root extract. So far the standouts of the four to me are the Eye Cream and the Serum - the eye cream has a whipped, buttery texture that feels divine on the skin and hasn't been causing any clogged pores/milia. It leaves my undereyes SO beautifully nourished and hydrated - I've definitely noticed some plumping of my fine lines. The serum also makes my skin feel super plump and nourished, and it also contains niacinamide to calm the skin - an ingredient my skin responds really well to. I will keep you posted on these as I use them more, but so far so good. 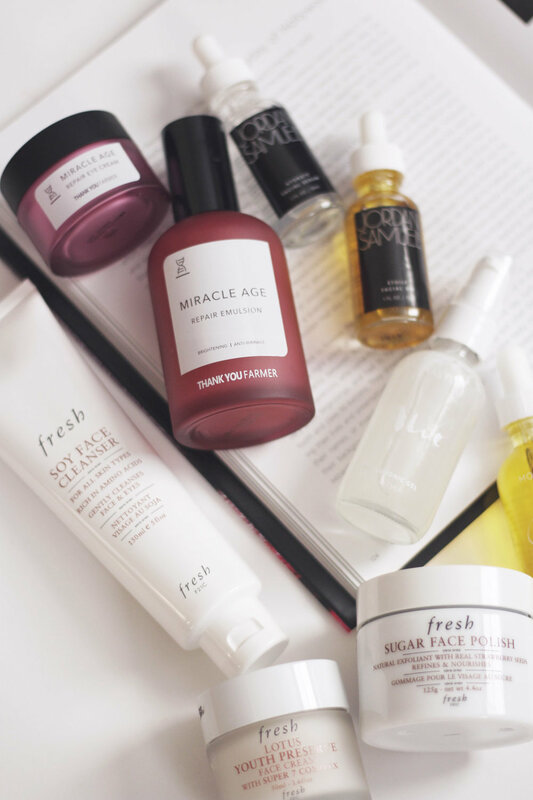 Fresh Beauty | I recently got the most exciting surprise package from Fresh, and I was so grateful! They were sending out a few of their Rose products, and since I had been posting about my love for the Rose Deep Hydration Facial Toner and Rose Deep Hydration Face Cream, so they sent me refills of those along with a few other hero products. I have lots of cleansers open and on rotation now, so I haven't opened it yet, but I've tried many many samples of the Soy Face Cleanser* and I know I already absolutely love it - cue me using large amounts of my open cleansers to finish them faster and get to this baby. It's not stripping on the skin whatsoever, removes makeup well, and leaves the skin feeling nicely cleaned and conditioned. I love using the Rose Cream at night, so I've been digging into the Lotus Youth Preserve Face Cream* during the day. It's been perfect for this transitional weather - it's rich enough to keep the skin feeling nourished all day long, but it doesn't feel heavy at all. It plumps up my skin nicely and leaves a bit of a tacky finish, which makes it an excellent base for makeup. And a standout product I had never even thought about trying is the Sugar Face Polish*. It's not abrasive or harsh, and it helps to chemically exfoliate with fruit enzymes as well as physically exfoliate with the sugar. This is a great pick-me-up to use in the mornings to help energize the skin. I'm in love.